← Calling All Parents, Teachers, and Professors! A week ago, I went to purchase envelopes and stamps. 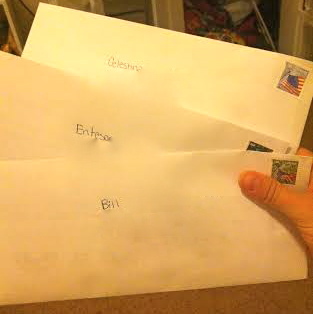 I rarely send letters anymore – blame technology or maybe just a lack of common sense, but I remember asking my mom how to address a letter just a few years ago – so after I made my purchases I thought, if I have all these envelopes and stamps now so “Why just send one letter?” I decided that instead, I would send three anonymous letters of encouragement to people. I also worried that if I only chose only one stranger, if I got his or her address wrong, no one lived there anymore, etc, no one would receive my letter! 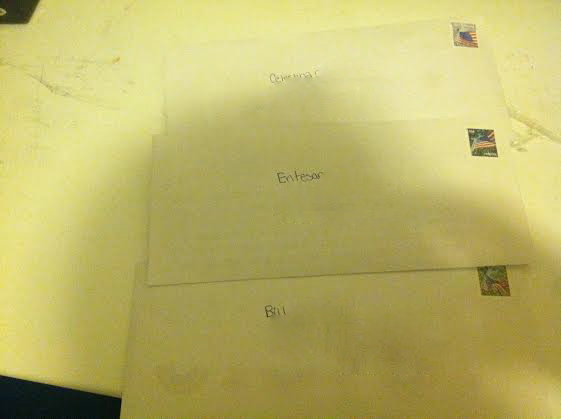 I hoped that by sending three letters, at least one of the recipients would receive my message. “This too shall pass.” – Unknown. “If opportunity doesn’t knock, build a door.” – Milton Berle. I hope you have enjoyed these quotes as much as I do. Why have I written to you? 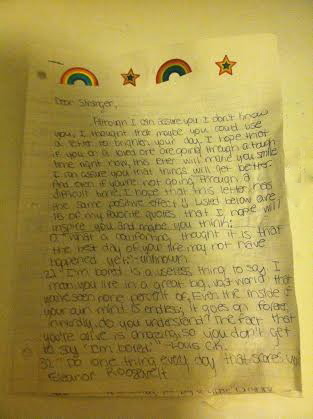 Although I selected your name randomly from a phone book, I would like to think that fate brought this letter to you. All I ask is that someday, you do a kind act for a stranger. Earlier in the week, I was feeling slightly stressed as the end of my college career approaches, and although writing the letters took about two hours, the act was one of the most peaceful and fulfilling things I have ever done. 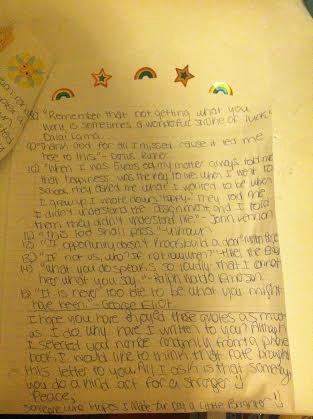 I decided to listen to The Beatles as I wrote them and put John Lennon’s “Imagine” on repeat several times. I then went to another website where I was able to search for people with the last name I landed on, along with their addresses, and used the same approach as I went through the list of people who share that last name. For the next two recipients, I looked for people with last names that begin with B, then C. A friend later asked, “Why didn’t you just use a random number generator?” and although I told him that would have been too easy, I had a lot more fun with this approach. Although I virtually “crossed this item off the list,” I had so much fun completing this one, it was therapeutic, and I still have 47 letters and 6 stamps to go, so I hope to continue going through the alphabet and continuing to send more letters. 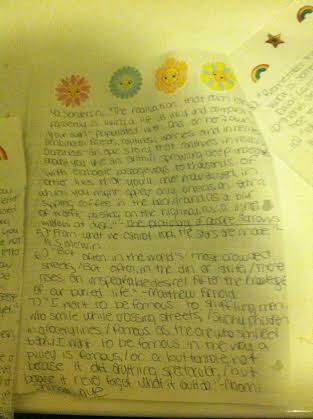 If I continue to send more anonymous letters, I think it will be an incredibly exciting project to work on. So has anyone else done something similar or want to cross this item off his or her bucket list now? I’d love to hear from you and about your experiences! Enjoyed this post? Please share it on Facebook, Twitter, StumbleUpon, or Reddit! This entry was posted in Kind Acts & Volunteering and tagged adventure, bucket list, happiness, inspiration, inspiring, kindness, people, positivity, volunteering, writing. Bookmark the permalink. Such a great idea! Good for you for taking the time to do this! Thanks so much Cheryl :)! Thank you so much for sharing this post :)! This is such a cool project! I love sending postcards; you’ve inspired me to try this out — imagine how it would feel to get a random postcard from the universe! Love this idea! I wish you lots of happiness doing it. What a wonderful inspirational young woman! I absolutely love this idea. I think I’m gonna do this sometime, too. I’ve also once read about people buying books and finding small notes of encouragement by complete strangers inside that made them smile. How do u send it to strangers without an address.?? I would really love to do this but scared of what if some one doesnt like it? or what if some one finds who i am ? Please help.I love this idea of selfless good deed. 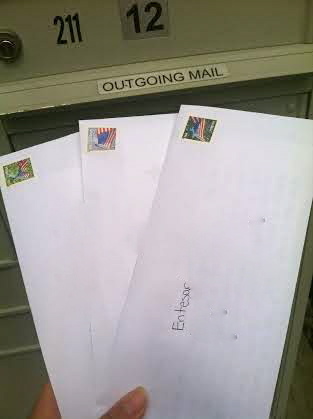 Ohh, I only edited out the address on iPhoto for the sake of privacy, but the actual letters had addresses 🙂 And I hope that they enjoyed it, lol. Let me know if you need any suggestions! What a wonderful site!!! Pleasure to be introduced to you and thank you for stopping by to support my site! Keep up the awesome life changing “light work”! Our world thrives because of people like you! Aww thank you so much :)! And you are very welcome! Such a great idea. Did you leave a return address? 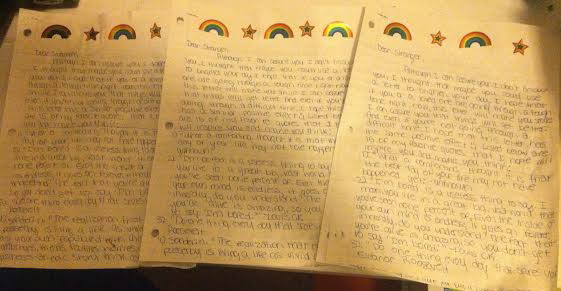 It would be amazing to know if those strangers wrote you back and shared their joy back with you. I didn’t leave a return address this time because I wanted to remain fairly anonymous, but that’s definitely a great idea for next time because it would be cool if they wrote back :)! I can say I would certainly write back! 🙂 At least to say thank you! Totally enjoyed your sharing! We all thank you for caring! Thanks 🙂 They’re some of my favorites! Love this! 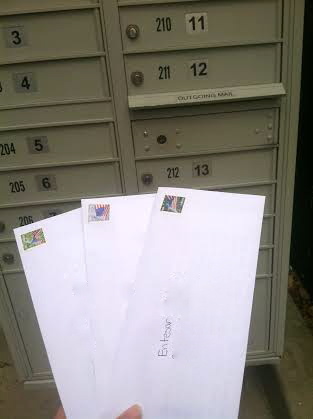 I sent Christmas cards one year to 10 strangers just because I love to get them so much and I thought maybe someone would appreciate it. I might have to do this too!